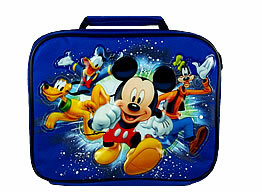 Material (canvas feel) lunchbox with raised plastic Mickey Mouse design on the front. Plastic lined and insulated. Zipper closure. Material carry handle and adjustable shoulder strap. Approximate dimensions: 9.75" wide x 7.75" high x 3" deep.